Chris and I are not very familiar with Italian wines. The few times we have had them they were very good. When we were at one of our favorite Italian restaurants downtown we tried a Nebbiolo. 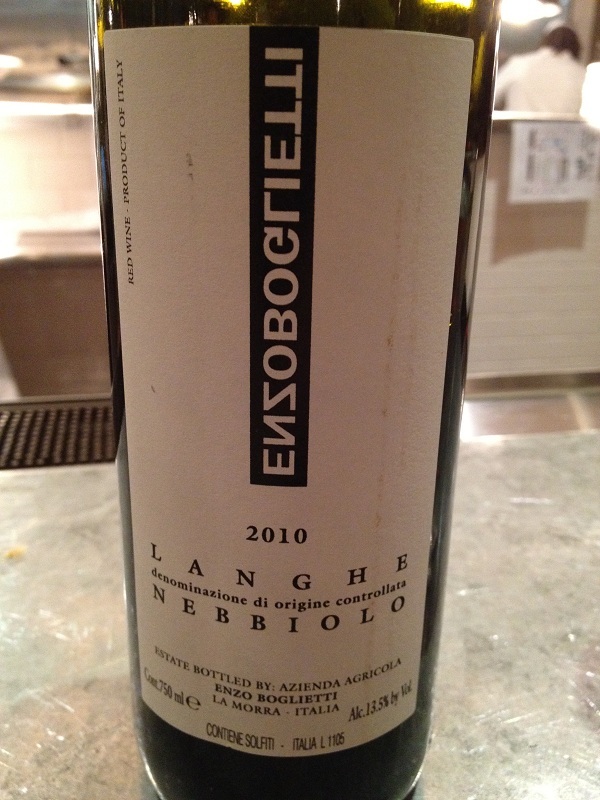 We were quite impressed and plan on searching for more Nebbiolo’s in the future. Did you know that there are 20 wine regions that cover the entire country of Italy? I would love to live in a place surrounded by grapevines and vineyards. We do plan on retiring and living by vineyards someday. We are going on a Cosentino, Girard, and Kunde wine cruise this fall and we are very excited!! This will give me some time now, to start studying and preparing for the trip. Reviewing the ports of call there will be plenty opportunities to sample the local wines. We decided to change things up and try something we have not had in a long time. 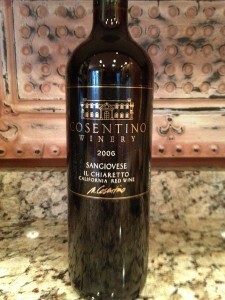 I wandered down to the cellar and grabbed a bottle of 2006 Sangiovese from Cosentino. I pulled the cork and poured some wine into my glass. As you have noticed in my past blogs I like to examine the wine before I try it. I enjoy looking at the color of the wine and reviewing the color. This will tell you how it is holding up. Reviewing this wine, it was dark to brick red. I could also see the “Meniscus” (color on the edge of the wine) was slightly clear. It was time to give it a smell. The nose of the wine was Cherry, Strawberry, and a hint of Vanilla. Chris thought she could detect licorice. It was time to give the Sangiovese a try. As we tasted the wine, the medium tannins approached our mid palate. The finish was nice and smooth. As I tasted the Sangiovese I could taste strawberry and red fruit. This wine is very good! I would definitely buy this wine again. 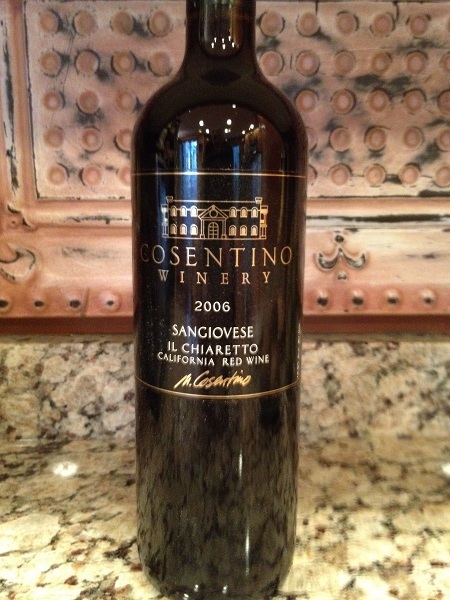 If you are a fan of Sangiovese hunt this one down! I would rate this wine as 3 glasses and Chris rated it the same.